1905 Sanborn Insurance Atlas - Thanks to the combined efforts of the San Francisco History Center and the David Rumsey Map Collection, this historic glimpse of San Francisco in the years leading up to the devastating 1906 earthquake is now available in full color. Created for fire insurance purposes, it includes precise detail on every building in city limits, including its use and construction. Before and After the Great Earthquake and Fire: Early Films of San Francisco, 1897-1916 - This Library of Congress collection consists of twenty-six films of San Francisco from before and after the Great Earthquake and Fire, 1897-1916. 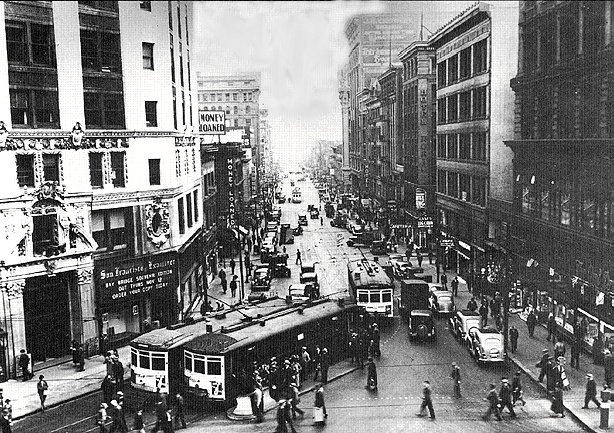 Seventeen of the films depict San Francisco and its environs before the 1906 disaster. Seven films describe the great earthquake and fire. The two later films include a 1915 travelogue that shows scenes of the rebuilt city and a tour of the Panama Pacific Exposition and a 1916 propaganda film. Buried Ships - The majority of what is known about the buried vessels hidden under the streets of downtown San Francisco is from recollections of early day pioneers. Portions of their recollections, along with those of other sources, have been compiled into a separate page. From these notes, and information on the old wharves, a map was created plotting the possible locations of the vessels. This map doesn't include every vessel mentioned, as some were buried near Yerba Buena Island (aka Goat Island), south of Rincon Point, and the North Beach areas, and exact locations of others were not given. California Historical Society (CHS) - CHS headquarters accommodate the administrative offices, North Baker Research Library, exhibition galleries, and museum store. Over 4,500 members belong to the Society. California Mission Studies Association (CMSA) - Dedicated to the study and preservation of the California Missions, presidios, pueblos, ranchos and their Native American, Hispanic and Early American past. Annotated links, directory of missions, and researcher aids. California Missions Resource Center - Guide to the history behind the California missions. California Missions Foundation - Dedicated to the preservation, protection and maintenance of California's 21 historic missions, including the San Francisco de Asis (Mission Delores) in San Francisco. Cliff House Project - This site preserves the visual imagery of Adolph Sutro's Victorian Cliff House. Daily Alta California - Available online: 10 December 1849 - 2 June 1891 (14775 issues). Digger Archives, The - The Digger Archives is an ongoing Web project to preserve and present the history of the anarchist guerilla street theater group that challenged the emerging Counterculture of the Sixties and whose actions and ideals inspired (and continue to inspire) a generation (of all ages) to create models of Free Association. Encyclopedia of San Francisco - An ongoing Web-based project of the San Francisco Museum and Historical Society. Engineering Geology of the Bay Area Rapid Transit (BART) System, 1964-75 - By J. David Rogers and Ralph B. Peck. Fort Point - From its vantage point overlooking the spectacular Golden Gate, Fort Point protected San Francisco harbor from Confederate and foreign attack during and after the U.S. Civil War. Its beautifully arched casemates display the art of the master brick mason from the Civil War period. Fort Point was built between 1853 and 1861 by the U.S. Army Engineers as part of a defense system of forts planned for the protection of San Francisco Bay. Designed at the height of the Gold Rush, the fort and its companion fortifications would protect the Bay's important commercial and military installations against foreign attack. The fort was built in the Army's traditional Third System style of military architecture (a standard adopted in the 1820s), and would be the only fortification of this impressive design constructed west of the Mississippi River. This fact bears testimony to the importance the military gave San Francisco and the gold fields during the 1850s. FoundSF - Discover and shape San Francisco history. Also see Community History Links page and learn more about the organizations behind FoundSF: Shaping San Francisco and the San Francisco Museum and Historical Society, two California, nonprofit, public benefit corporations. Freedom Archives, The - Contains over 10,000 hours of audio and video tapes which date from the late-1960s to the mid-90s and chronicle the progressive history of the San Francisco Bay Area, the United States, and international movements. Gold Fever - This Oakland Museum of California exhibit commemorates the discovery of gold at Sutter's Mill on January 24, 1848, and the frenzied rush to California of gold seekers from around the world. Graffiti Archaeology - Photos of San Francisco graffiti taken by different photographers from 1998 to the present. History of San Francisco - Wikipedia backgrounder. J. Porter Shaw Library - Established in 1959, the J. Porter Shaw Library is part of the San Francisco Maritime National Historical Park, and focuses on sail and steam on the West Coast and in the Pacific Basin from 1520 to the present. Java Hut Series - San Francisco's Java Huts are memorialized in these pictures. Temporary Monuments: they characterize San Francisco, identify the historic guts of this town, and portray an era when the waterfront was teeming with a life that was the heart blood of this great city. Labor Archives and Research Center - San Francisco Bay Area labor history is preserved in primary source and vintage history materials at the Labor Archives and Research Center.The Labor Archives is a unit of the J. Paul Leonard Library at San Francisco State University. Los Gatos Art Bridge - A history of the mid-1960s artists, architects and artisans Los Gatos, a small town on the edge of Santa Clara County's emerging Silicon Valley, who came to it's downtown's rescue. They rebuilt, restored the heart of the town, and revitalized the spirit so nearly lost to malaise and disinterest. Making and Naming of Streets in San Francisco - By Samuel L. Lupton. Museum of the City of San Francisco (Gladys Hansen, curator) - With exhibits about the 1906 earthquake, California Gold Rush, internment of the Japanese during World War II. National Register of Historic Places Listings in San Francisco, California - Wikipedia. Bernal Heights History Project - The Bernal Heights community was developed in 1839 as part of a large Mexican land grant belonging to Don Jose Cornelio Bernal, called Rancho Rincon de las Salinas y PotreroViejo. Don Bernal used the area as grazing land for his cattle. The hill was surrounded by the salt marshes of the Bay, which were most likely the original fishing and hunting grounds of the local Olhone village before they had occasion of experiencing the sanctity of life in the Missions. "Ora et Labora" was the creed in those times, where the fathers were the oratores and the locals the laboradores. San Francisco History Association - A group dedicated to remembering our San Francisco's colorful past, and to celebrating its rich culture today. Western Neighborhoods Project - A nonprofit organization formed to preserve and share the history and culture of the neighborhoods in western San Francisco. Online Archive of California (OAC) - Provides free public access to detailed descriptions of primary resource collections maintained by more than 200 contributing institutions including libraries, special collections, archives, historical societies, and museums throughout California and collections maintained by the 10 University of California (UC) campuses. Browse, locate resources, or view selected items digitally. OAC contains more th 220,000 digital images and documents. Pier 70 San Francisco - Historic shipyard at Potrero Point. San Francisco - A photographic tour of some neighborhoods in San Francisco. San Francisco Architectural Heritage - Encourages appreciation of the built environment and understanding of the value of preserving significant San Francisco architecture. Offers lectures, workshops, seminars and architectural walking tours. San Francisco Call - Available online: 1 April 1890 - 31 December 1913 (8649 issues). San Francisco Geneology - Containing records for the City & County of San Francisco. San Francisco Historical Photograph Collection - Contains more than 250,000 photographs of San Francisco and California scenes ranging from 1850 to the present. Includes views of San Francisco street scenes, buildings, and neighborhoods, as well as photographs of famous San Francisco personalities. Also includes the photo morgue of the San Francisco News-Call Bulletin, a daily newspaper. San Francisco Historical Society (SFHS) - Preserves, interprets and presents the historical heritage of San Francisco from its variegated natural history to its lively human history. Also, visit the SFHS Research page for additional San Francisco history resources, organizations and websites. San Francisco History - Full text books, articles, and archival news on San Francisco history. 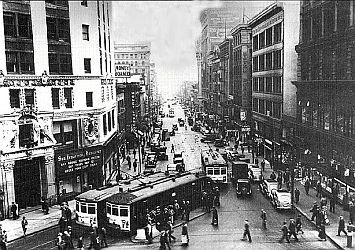 San Francisco History 1900-1950 - A timeline. San Francisco History 1950 to Present - A timeline. San Francisco History by Subject - Brought to you by The Museum of the City of San Francisco. San Francisco History Center - Located at the San Francisco Public Library. Contains a comprehensive, noncirculating research collection of materials covering all aspects of San Francisco, and to a lesser extent California and the West from the time of its earliest inhabitants to the present. The Center is also the official archives for the City and County of San Francisco. San Francisco Journeys - Guided walking tours with Monika Trobits. San Francisco Maritime Historical Park - Located at the west end of San Francisco's Fisherman's Wharf, this park includes the fleet of national historic landmark vessels at Hyde Street Pier, a visitor center, maritime museum and library. Visitors can board turn-of-the-century ships, tour the museum and learn traditional arts -- like boatbuilding and woodworking. The Park offers educational, music and craft programs for all ages, and provides unique opportunities for docents, interns and volunteers to learn more about the nation's maritime heritage. San Francisco Maritime Museum - Inside this ship-shaped, streamline-moderne structure, built as a WPA-project, mast sections, jutting spars and ships figureheads are arranged among the colorful fish and gleaming tiles of muralist Hilaire Hiler's expressionist vision of Atlantis. Displays include panels, video, oral history re-creations, models and interactive exhibits. San Francisco Media Archive - Film history and preservation. San Francisco Museum and Historical Society - A non-profit organization focused on preserving, interpreting, and presenting the historical heritage of San Francisco. The Society also produces two publications: The Argonaut, a beautiful journal featuring photographs and in-depth reviews of our city's history; and Panorama, a quarterly newsletter for members that features upcoming programs and events including those of other Bay Area historical groups. San Francisco Museum at the Mint - San Francisco is one of the few great cities in the world without a major institution dedicated to its history and culture. The San Francisco Museum and Historical Society serves as the focal point for discovering the history of the Bay Area, including the creation and ongoing operation of a world class museum in San Francisco's Old Mint. San Francisco People - Links to resources on San Franciscans. Presented by Z San Francisco. Shaping San Francisco - A living archive of the city providing people with access to its lost history. Story of an Eyewitness, The - Jack London's account of the San Francisco Earthquake and Fire, first published in Collier's on May 5, 1906. Timeline of San Francisco History, A - From 1542 - 1996. Presented by Z San Francisco. Up and Down These Mean Streets - Don Herron leads The Dashiell Hammett Tour in San Francisco, now the longest-running literary tour in the nation. On this site you'll find information on current walks - dates, where to meet, arranging tours by appointment - plus a hard-boiled blog with news, reviews of books and film, and a dash of noir. zpub - Providing material not available elsewhere. Authors such as Bruce Seymour have contributed the notes that he used in writing his biography of Lola Montez. Other book authors such as J. Kingston Pierce have contributed book chapters to this site. Ron Filion used this site to archive his extensive collection of source material relating to San Francisco history. This webpage last updated on Wednesday, January 6, 2016 6:37 PM.